Looking for help with either the website, your magazine delivery or a lost or Found bird? We've compiled a list of the most frequently asked questions to guide you. If you have a question not covered here please contact us. Why do I need to register with the site? Registering when shopping: Registration enables you to track your orders in our shop and access your free and purchased downloads from your account area. Registering when placing a Free Ad: This allows us to check the validity of the adverts and remove ads not meeting our terms and conditions. Registering to post on the Forum: So you can post and receive replies and follow up posts to your threads. * One registration gives you access for all areas. I'm trying to register but the site is telling me registration has failed, what do I do now? Once you registered you'll be sent an email with a confirmation link in it, (please check your spam folder if this hasn't arrived!) Once you've clicked the link and confirmed your email address you'll be able to login and use the registered areas of the website. Why do you require registration confirmation? To ensure you have access to the email account you registered with and to deter bogus registrations. I can't remember my password or username what can I do? Use the password reminder option on the login tab and follow the instructions to reset your password or be sent a username reminder. You will need to know the email address you registered with! Can't remember the email address you registered with? Contact us. Your subscription will start with the next available mailing issue. For the security of parrot owners the magazine is delivered in a plain gray polythene wrapper the sender name is Imax Visual. The magazine is not visible through the wrapper. I've moved home how do I let you know? You can email us, please quote your customer number and tell us your old address and new address, we'll update our records to your new address. I purchased an eMag/pdf how do I download it? 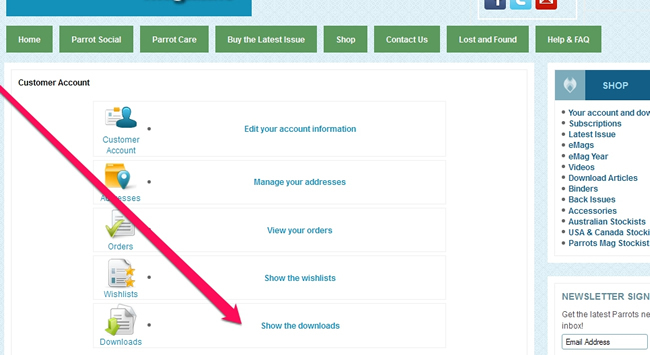 Your order confirmation email includes a link (blue) if you click this it takes you straight to your browser and starts the download automatically, you will see a blank page but your download will begin immediately. You can login to your account area (click here) and you will see your downloads area at the bottom, click on the link to get download your eMag.